This week, we became proud recipients of three PRSAHR 2017 Pinnacle Awards. 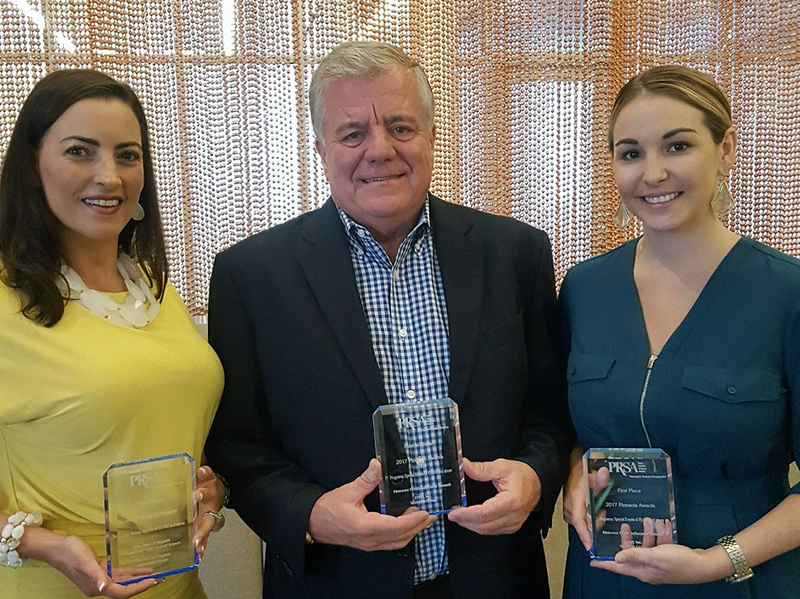 The ceremony recognizes the best public relations programs and tactics in the Hampton Roads region, and we celebrated wins for two clients; STIHL Inc and Port of Virginia. Influencers learned all the facets of the STIHL story, including its manufacturing operations, distribution strategy, support of independent businesses, sponsorships and new product lines. The event functioned as a “sneak peek” of the STIHL Lightning Battery SystemTM launching in Spring 2017, as well as an introduction to an Influencer Marketing program for STIHL. The goal of the SUMMIT was to implement an Influencer Marketing program at STIHL and expand our client’s reach in new digital media. Our anticipated impression goal has since been exceeded by more than 10 million. The Pinnacle judges said The Port of Virginia Fiscal Year 2016 Annual Report “showed a human side of the Port operations” and praised the design. What great feedback to receive as our task on this project was to provide a face to the Port through its annual report. Our creative team developed a cargo box-shaped cover with the report imagery focused on “the people” of the Port — both customers and end users, to include the general public. The public relations team filled the report with the stories of the people who do business with the Port and those impacted by the cargo it handles daily. Through story-telling, we shared the momentum the Port is experiencing as a result of recent large investments by the Virginia General Assembly. The theme of momentum and the people making it happen are intertwined from page to page. By design, the book itself took on a shape and size different from anything The Port of Virginia had distributed in the past — similar to a coffee table book. It featured a centerfold image of the Norfolk International Terminals (NIT) for use as a pull-out poster and several two-page spreads heavy on imagery, light on copy. The annual report is delivered to 9,500 stakeholders, law makers, economic development leaders, customers and business leaders across the Commonwealth. These awards wouldn’t be possible without having amazing clients, as these projects were all an extension of their passion, values and culture! We also want to thank the Hampton Roads Chapter of PRSA for being champions of our industry.